SEATTLE, Washington, February 21, 2012 (ENS) – A federal court in Seattle has denied a preliminary injunction in the case of The Institute for Cetacean Research vs. Sea Shepherd Conservation Society. The motion for an injunction was an attempt by the Japanese whaling organization to immediately halt Sea Shepherd’s anti-whaling activities in the Southern Ocean Whale Sanctuary. Judge Richard A. Jones made it clear that in addition to looking at Sea Shepherd’s activities in the Southern Ocean, the issue of whaling and its legality would be at the heart of this case. Sea Shepherd’s legal team, Harris and Moure, argued, and the judge acknowledged, that Sea Shepherd is not a violent organization and does not intend to cause harm to anyone. Sea Shepherd uses tactics to keep the Japanese whalers from killing whales that include flinging red paint onto the whalers’ hulls to symbolize blood, throwing bottles full of stinky but harmless butyric acid onto the vessels, encircling them with inflatable boats, and shining laser light into the whalers’ eyes. The court declared that it does have jurisdiction over this case based on the Alien Torte Statute and admiralty jurisdiction. This law allows people who are not U.S citizens to file civil suits in U.S. federal courts for cases dealing with violations of international law. The court expressed displeasure with the Japanese whalers for filing an injunction against Sea Shepherd while appearing to be themselves in violation of an injunction issued by the Australian Federal Court. The Australian injunction prohibits the Japanese from hunting whales in the Australian Whale Sanctuary, where the whalers do often hunt. Judge Jones asked the plaintiffs, represented by Portland-based law firm Miller and Nash, why they believed they should be able to ask another court for an injunction that benefits them, when they are clearly in violation of an injunction themselves. The plaintiff’s answer to this was that because the ships move they cannot confirm whether the whaling fleet is in Australian waters and therefore in violation of this injunction. As Sea Shepherd crews can attest, the Japanese whaling fleet has been in direct violation of this court ordered injunction issued in 2008 and have certainly killed whales within the Australian Marine Sanctuary. Sea Shepherd has filed a motion to have the entire case dismissed from the U.S. court system on the grounds that this case should be resolved in either World Court, Australian Court or through diplomacy. The court requested more time to sort through the specific issues and arguments before ruling on this motion. 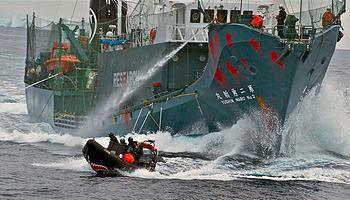 Judge Jones said if the case does go to trial that the court will hear arguments on the legality of whaling. “Now, it is clear to me that a substantial portion of the world believes it is very much not in the public interest to continue killing whales in the Southern Ocean. It is also clear to me that the environmental harms, like the killing of hundreds of whales, are relevant in the balance of hardships. So please understand in this context I must consider this aspect of the facts,” said Judge Jones. Kyodo Senpaku Kaisha Ltd is the company which carries out Japan’s “scientific” whaling under contract to the Institute of Cetacean Research, based in Tokyo. The two whaling organizations said they will study the details of the ruling and evaluate their options to ensure safety at sea in the future.